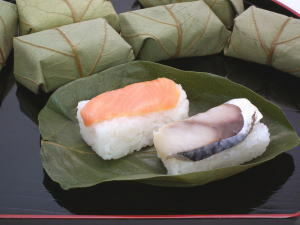 Kaki no Ha Zushi ('柿の葉寿司', is classified into sushi), is known as Pressed Sushi Wrapped in Persimmon Leaf in English, and 柿子叶寿司 (Shì zǐ yè shòusī) in Chinese. It is the washoku. Kakinoha Oshi Zushi, Persimmon Leaf Sushi. 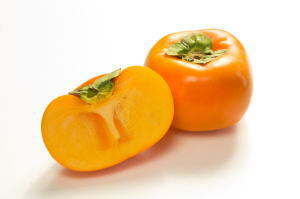 Kaki No Ha Zushi (Persimmon Leaf Sushi) is a local dish of Nara, Wakayama, and Ishikawa Prefecture. It's a sushi wrapped in a persimmon leaf pressed fish on sushi rice. 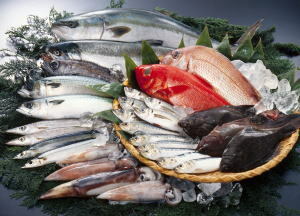 We can eat this dish at sushi restaurants or bento shops in those Prefectures.